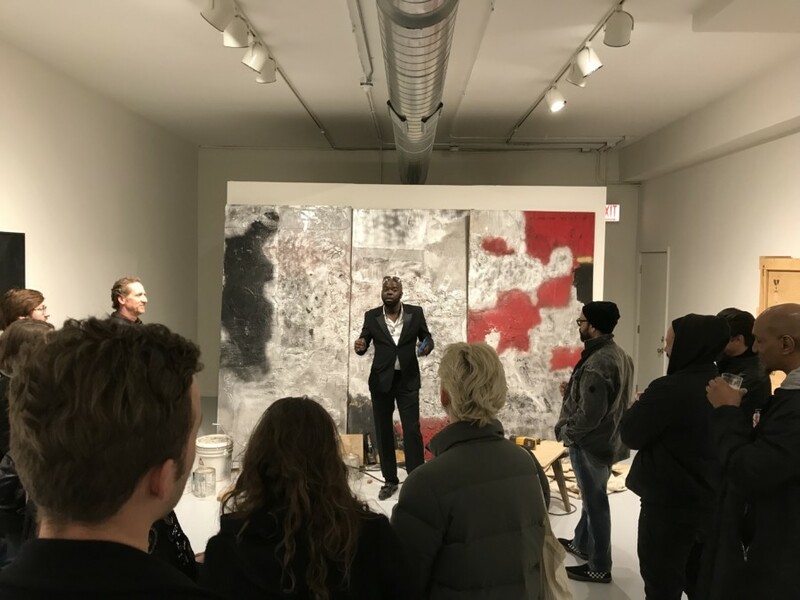 Join us for an artist talk with Chicago artist Cleveland Dean about his exhibition “I Am? – The Divinity of Insecurity” and his art practice. Dean will also answer audience questions. As a multidisciplinary artist, Dean manipulates unconventional materials to create richly textured mixed media works that embody emotional dualities such as frustration and triumph or confidence and insecurity. These contradictory sensations are represented in I am-after in which Dean repurposed materials from discarded, unfinished work to create an entirely new piece. The base of the work is a wooden panel on which Dean utilizes shou sugi ban, a traditional Japanese method of burning that appears to destroy the wood’s exterior but in fact preserves its internal structure. Layered on top is a sheet of shattered glass found in his studio, its shine contrasting with the matte black of the burned wood. While working with shou sugi ban and glass are characteristic to his art practice, combining the techniques in one piece and repurposing discarded materials is a new process Dean is exploring as a way to confront his own insecurities. The show’s title begins with a question, setting the tone: of insecurity. A feeling familiar to all, Dean experiences it keenly not only by exhibiting new work and also by displaying Hales, unfinished work in the gallery. Showing unfinished work in a gallery setting “is the deepest vulnerability for an artist,” he explains. Despite this sensitivity, Dean encourages viewers to question his work and his process by permitting them to touch the incomplete piece, allowing them to see and feel the exposed layers of acrylic, salt, enamel, resin, and distressed wood that fabricate his artwork. Viewers also have the opportunity to question and reflect on their own insecurities through #theselfproject-remix, an ongoing series comprised of framed mirrors etched with phrases such as “It’s ok to cry, “If they only knew,” and “Help.” As visitors stand before the mirrors, their reflections merge with the writing, forcing them to confront how they relate to the words. They are then encouraged to activate the artwork by taking selfies and sharing them on Instagram. By using the series hashtag, an online community is created surrounding the issues proclaimed by the mirrors, uniting the users through art. Through I am? – The Insecurity of Divinity, Dean offers audiences a glimpse into his psyche while also inviting them to delve into their own.